With all the attention brought recently to the politically motivated prosecutions of the DOJ, culminating in the high-profile Supreme Court exoneration of former Virginia Governor Bob McDonnell, you would think prosecutors would start backing off on dishonest witch hunts against prominent Republicans. But they’re not in Salt Lake City. Similar to red states like Arizona and Texas, Utah’s legal system is predominantly controlled by the left. Since they can’t get any traction in elections statewide, Democrats abuse the legal process to destroy elected Republican officials. It’s always the same, tired old, vague “ethics” laws that are used: bribery, public corruption, etc. It’s not hard to find some transaction a politician participated in and find an angle where the elected official allegedly benefited. Negotiate a contract with the electric company to save the city money? The Republican official must have a relative whose large house will benefit from that electric company. Award a contract to a more efficient technology company? The Republican official must know one of the the thousands of employees who work at the company, so it’s a quid pro quo. Hire one of the savviest names in business to clean up an area of government? The innovator must have given the Republican official a Christmas gift in the past if they knew each other, so it’s clearly bribery. And when the beleaguered official fights back in court? Obstruction of justice. And so on and so on. Since the prosecution has virtually unlimited government resources, and public officials are usually forced to provide their own defense, it is extremely difficult to beat these inquisitions. Other prominent Republicans often desert them, afraid of being found guilty by association. 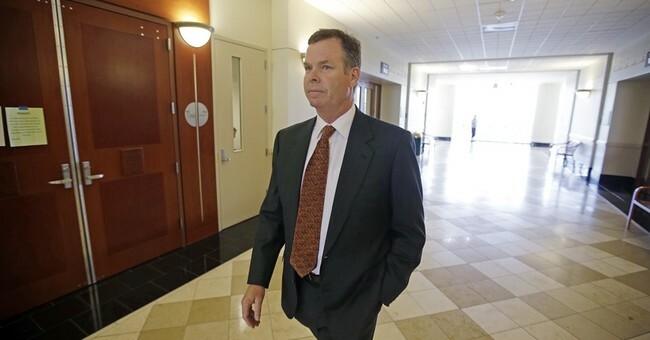 Former Utah Attorney General John Swallow is facing 12 felonies and one misdemeanor for bribery, accepting gifts and obstruction of justice. Swallow’s four-week trial begins on February 7. He has pled not guilty. Mark Shurtleff, the attorney general who preceded him, was also arrested on corruption charges arising out of the same circumstances, but prosecutors later dropped them. Marc Sessions Jenson, a wealthy businessman, ran afoul of the law in the 2000s for swindling millions from investors. Shurtleff “was responsible for the investigation, conviction and sentencing of Jenson" in the 2000s. After being sent to prison and failing to pay $4 million in restitution, he accused the two attorneys general of wrongdoing with his case — despite the fact it was the judge who wanted the restitution penalty and prison, then locked him up for not paying the money — not the two attorneys general. Jenson accused Swallow and Shurtleff of accepting lavish gifts from him in exchange for helping him “navigate his legal troubles from inside the office.” However, unless the gift was given in anticipation of a quid pro quo, it is not unethical to accept gifts from an acquaintance. In response to Jenson’s accusations against Shurtleff and Swallow, Shurtleff warned, " … He has sworn revenge. I suggest you consider carefully whether to believe a desperate, convicted fraudster." Jenson also accused Shurtleff’s friend Tim Lawson of accepting bribe money from him to in order to influence Shurtleff. Lawson responded, "Jenson is in prison because he is a pathological liar, because he lied to the people he stole money from." In a second accusation, indicted businessman Jeremy Johnson accused Swallow of instructing him to contribute money to former Sen. Harry Reid (D-Nev.), in order to persuade the senator to have the FTC drop its investigation into his businesses. Swallow acknowledges Johnson approached him in 2010 because the businessman thought he was being unjustly targeted by the FTC. Swallow agreed to help direct him to find lobbyists — which is not unethical — to deal with his FTC troubles. Emails show that Swallow set Johnson up with RMR Consulting to work on influencing Reid. Swallow maintains that he did not go further than that. "I told Jeremy I could not and would not intervene with the FTC on his behalf, given my position with the state [attorney general]," Swallow said. He said Johnson also asked him to approach the U.S. Attorney on his behalf, and again Swallow refused. When the FTC failed to stop its investigation into Johnson’s companies, Johnson started demanding back the money he had paid to RMR Consulting. He admitted he did not know if any of the money he paid in the deal actually reached anyone connected to Reid. Johnson was arrested for mail fraud and continued to pressure Swallow. He arranged a meeting with Swallow where he secretly videotaped and recorded him. Yet he was unable to incriminate him. Throughout the meeting, Swallow consistently states his role must be limited to assisting with obtaining lobbyists, "I'd like to have it legally through lobbyists," he says. It appears that the only evidence of Swallow telling Johnson to bribe Reid is Johnson’s testimony. But as we’ve learned from previous wrongful prosecution cases like that of former Congressman Rick Renzi, key witnesses can be lured by the prosecution to change their testimony with thousands of dollars of reward money dangled in front of them. This is illegal if not divulged to the defense and jurors. Or perhaps Johnson received an assurance that time would be shaved off his sentence should he implicate powerful Republican officials. What this comes down to is Swallow was targeted because he was an activist conservative. He sued the Obama administration in an attempt to overturn Obamacare and to demand the return of federally controlled lands in Utah back to the state. He received an A+ rating from the NRA and was endorsed by the organization when he ran for attorney general. As a state legislator, he sponsored the largest tax cut in Utah’s history and was named Taxpayer Advocate of the Year by the Utah Taxpayers Association. When the DOJ announced it was investigating Swallow, the Utah Democratic Party Chairman gleefully issued a statement praising the development. Swallow appears to have an ethical background, there doesn’t seem to be an unethical bone in his body. Even more telling, in Swallow’s case, the DOJ actually did the right thing and decided in 2013 not to file public corruption charges against him, nor against Shurtloff. Yet local prosecutors disregarded this exoneration and brought their own charges. They asked the judge to conceal the exculpatory fact from jurors that DOJ prosecutors had declined to prosecute Swallow — and incredibly the judge agreed. They also got the judge to withhold the fact that state prosecutors dropped all charges against Shurtleff. Assistant Salt Lake County district attorney Chou Chou Collins bizarrely claimed that it was “irrelevant” and would “confuse” the jury. In another over-the-top move, prosecutors arrested their own witness earlier this month, a former deputy attorney general, after he told them he wouldn’t be able to testify against his ex-boss because he had a conflict with the trial date. But instead of working with him to find a mutually agreeable date, prosecutors arrested him while he was in town for his mother’s funeral. Perhaps he didn’t want to testify against an innocent man and they knew it. So who is really crooked here, businessmen in prison who have not much more evidence against those accused than verbal stories, or an attorney general who merely inherited the doings of his predecessor — a predecessor who has been completely exonerated? This has all of the elements of a typical witch hunt by the left against conservatives — hopefully they won’t get away with it this time around.